Money Boss — and More! This is a brief update on what I’ve been up to for a past few months. I know I’ve been quiet around Foldedspace, but that doesn’t mean I’m sitting at home reading comic books and playing videogames. Far from it! I’ve waited to officially announce Money Boss here because I wanted to make sure I’d follow through on my commitment to the site. I’m a notorious starter and stopper of projects, and I didn’t want to publicize this until I was sure I’d stick at it. Now I’m sure. (I’ve been at it six months already.) In fact, I’m proud of what I’ve already done with the blog. Money Boss contains the best material I’ve ever produced about personal finance. The site has 2000 email subscribers already and is growing rapidly. You should come join us! 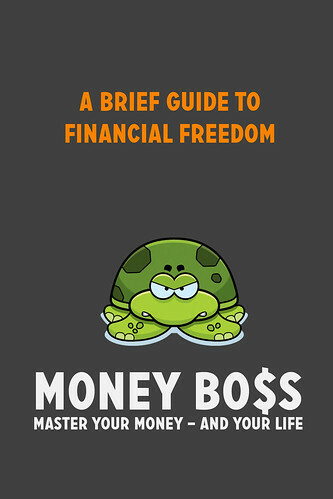 So that all Money Boss readers can share a common framework for talking about finance, I’ve collected my core philosophy into a free 70-page manual entitled A Brief Guide to Financial Freedom. This guide outlines everything I’ve learned about smart money management during the past decade. Sometime soon(-ish), I intend to record audio versions of this material too, which will provide a fourth way to consume it. That project might have to wait until Kim and I are finished with our U.S. roadtrip, though. Speaking of our roadtrip, Kim and I left Savannah on March 29th to begin our six-month journey back to Oregon. As always, we’ll be documenting our adventures at Far Away Places — although generally with a delay of around two weeks. I just posted the first installment for 2016, which is about our time in beautiful Asheville, North Carolina. I hope to finish the post about our ten days in Tennessee by tomorrow morning. Lastly, I’ve made several appearances on podcasts during recent months. The more I do this, the more comfortable I get — and the more useful my interviews seem to be. I’m especially proud of my recent appearance on the M.O.N.E.Y. Show with J. Money and Paula Pant. This might be the best interview I’ve ever given. Other notable recent appearances include an episode of Radical Personal Finance with Joshua Sheats, a chat with my friend Eric Rosenberg on his Personal Profitability Podcast, and a conversation with the charming Michelle Jackson of Girl Gone Frugal. Whew! As you can see, I haven’t been slacking. I haven’t had much to share here — though I’ll continue to post when I have something to say — but I’ve been busy elsewhere. (And this list doesn’t even include the projects I’m not ready to publicize yet.) I used to be a slacker. Now I’m a workaholic. What happened? Darn! You were here in Savannah and I didn’t even know. I would have been so glad to have bought you and Kim a cup of coffee. I so hope you enjoyed our fine city and enjoy the rest of your journey. Now to read the rest of the post! I didn’t get beyond the “six months in Savannah” line. Hi–since you are going to a chautauqua, have you ever considered visiting Chautauqua, NY? (it’s near Buffalo–you probably passed right by it earlier.). It’s a very well-preserved 19th-century village where the whole idea of community educational meetings was born. Plus, it’s right next door to Lily Dale, a spiritualist (think seances and ghosts) encampment from the same era, which is a hoot.